Interested in Cosmetic Dentistry in Northeast Philadelphia? Visit P3 Dental! P3 Dental of Northeast Philadelphia is committed to caring for all of your dental needs - including enhancing the appearance of your smile. We offer cosmetic dentistry services in Northeast Philadelphia designed to both care for any underlying problems and to make your teeth look amazing. If you've always associated dental care with metal, you'll love our alternative cosmetic dentistry approach. Why Choose a Cosmetic Dentist in Northeast Philadelphia over Traditional Dentistry? 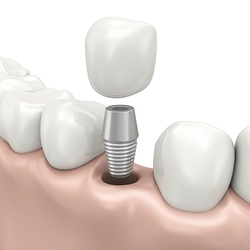 For patients with missing teeth, dental implants are a near-permanent, attractive alternative to dentures. Whether you've lost a single tooth or multiple teeth, dental implants have several cosmetic, lifestyle, and oral health advantages over dentures. If you have crooked teeth, gapped teeth, crowded teeth, or bite problems, we may suggest veneers or Invisalign. Veneers are thin, porcelain pieces placed on top of your teeth to instantly transform your smile, while Invisalign is a series of clear aligners that slowly move your teeth into position over time. Depending on the problem you need to correct, these cosmetic dentistry procedures could make a tremendous difference in your life without requiring metal braces. Is Cosmetic Dentistry the Right Choice for You? Request an Appointment Today! Whether you want a brighter smile or need to correct a major dental problem, cosmetic dentistry uses corrective and cosmetic dental techniques to create a healthy, attractive smile. Contact us to schedule an initial consultation with our team to find out if cosmetic dentistry is the right choice for you. We will go over your medical history, conduct a thorough exam, discuss treatment options with you, and help you make an informed decision.